Must call to take advantage of $119 per night special!! Secluded cabin located in the Blue Ridge Mountains of North Georgia above Alpine Helen. Chimney Shadows Cabin is named for Chimney Mountain that can be seen from the cabin's back porch. This Log cabin has a secluded Hot Tub on a screened back porch and a gas log fireplace in the living area. Enjoy the mountain Laurel in the Spring or the colorful foliage in the fall from the covered front porch rocking chairs. You may like visiting in the Winter in hopes of getting snowed in while being nice and cozy in front of your gas-log fireplace or you can enjoy the outdoor hot tub anytime of year. The Chattahoochee River is only 5 miles away and everyone knows to 'shoot the hooch' in the summer. Summer is also a great time to visit Unicoi State Park and Lake. 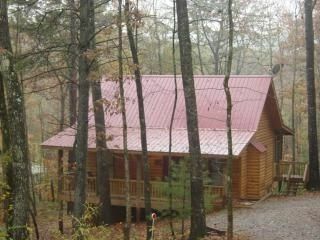 Unicoi Lake and Anna Ruby Falls are only 1.5 to 2 miles from this cozy cabin. Alpine Helen is the tourist hot spot here in the Mountains of North GA. Visit us in the fall for the worlds longest running Oktoberfest. Helen, GA is centrally located to Hiawasee, Blairsville, Dahlonega, Ellijay, Sautee Nacoochee, Lake Burton, Lake Vogel and Brasstown Bald, Georgia's highest Mountain. North GA is also known for it's Great Wines. Visit Three Sisters, Frog Town, Wolf Mountain, Black Stock and Habersham Wineries, along the GA Wine Highway while in the area. North Georgia also has abundant wildlife, many hiking trails, lakes, rivers, and waterfalls. So whether you need a 'nature fix', or you are planning a family vacation, romantic getaway or just a long weekend, Chimney Shadows Cabin is your best bet for accommodations. High Value without the high end price. Call for last minute specials and seasonal discounts!! bath towels provided (set of 4) beach towels recommended for hot tub year round and water activities during summer months. House was spotless inside and out! Hot tub was crystal clear. Ms. Sadie was so helpful. One call or text away. Answered all questions within minutes. She takes pride in her home and service. Perfect distance from town to be away from it all but, close enough to drive in for dinner or groceries. Home away from home. Totally relaxation. Peace and quiet. Wanted to get away from the big city for a few days. I had a relaxing time and some fun in and around the nearby town of Helen. The cabin was perfect. It was very clean, very well stocked and ready to enjoy. Loved hearing the rain on the tin roof. We do plan to go back again. There were four adults in my party and we were very comfortable in this cabin. The kitchen was well stocked with essentials. When we arrived things were very clean and check in was very easy. I would definitely stay here again. A little bit outside of town, which was nice because you felt like you were at your own mountain cabin away from it all. Love sitting on the front Porch in the rocking chairs and using the hot tub in the back. I would suggest a few puzzles or board games, but honestly, it was perfect. I was surprised to find an extra bed upstairs, and the WI-FI was fast, and Direct TV worked, even in a downpour! Some suggestions for future guests...Keep the porch light on before you leave for dinner...it gets very dark (no street lights), so that is a necessity! Also, make sure the spa is not set to sleep mode. Once we realized our mistake, we were able to enjoy the spa much better! Located near Unicoi State Park and Anna Ruby Falls and Minutes from Alpine Helen. Enjoy hiking the Appalachian Trail, biking, tubing the Chatahoochee River, shopping, site seeing or just kicking back and relaxing in your private hot tub. Rates are based on double occupancy and subject to additional cleaning fee for more than two guest.